Fierce Invalids Home from Hot Climates. Fully bound in forest green leather. A pair of fearsome eyes are red and gilt-stamped to the front board. 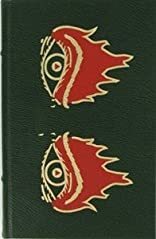 Two small flame designs, the author"s name, the Title, the Signed First Edition indicia, and the publisher"s name are red and gilt-stamped to the spine, separated by two untooled raised leather bands.